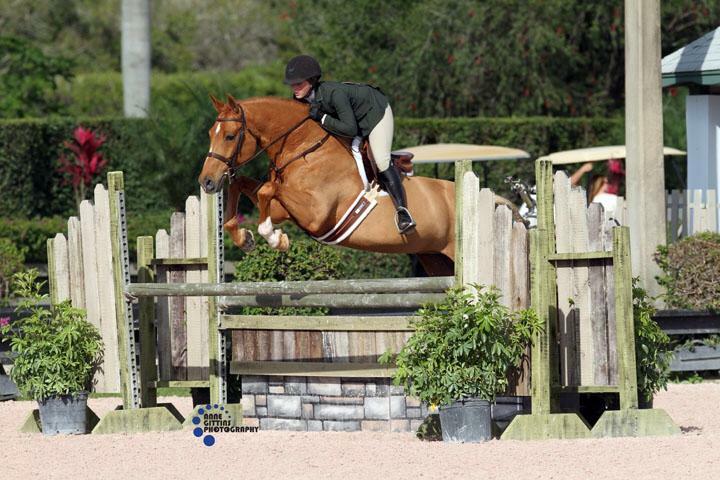 Piper Benjamin and Corvine were Large Junior Hunter Reserve Champions and High Point Junior Owner/Rider at WEF 10. Photo by Sportfot. Wellington, FL – March 18, 2014 – Piper Benjamin, 17, of Lake Forest, IL is celebrating the results of her hard work after a successful week showing at the Winter Equestrian Festival in Wellington, FL. Benjamin was Reserve Champion with her horse, Corvine, in the Large Junior Working Hunter division and also received the prestigious award of High Point Junior Owner/Rider. Benjamin trains at Brookwood Farm in Antioch, IL with trainer/owners Rush and Caroline Weeden. The farm spends January through March at the Winter Equestrian Festival and also has a team that attends the local shows in Chicago with clients at home. Benjamin has been riding with the Weedens for about five years and now owns or leases four horses. Corvine is a seven year old warmblood gelding whom Benjamin has had great success with in Junior divisions at other shows across the country including Kentucky and Traverse City, Michigan. Caroline Weeden also shows the horse in the professional divisions and won several classes at the Winter Equestrian Festival this season in the Performance Hunter division. Benjamin is lucky enough to have two other mounts she showed in the Small Junior Hunter division, Texas and Topsider. Both horses were in the top ribbons in both the Junior division with Benjamin and the Performance Hunter divisions with Weeden as well. Piper Benjamin rode Texas in the Small Junior Hunters 16-17. Photo by Anne Gittins Photography. Benjamin also had the privilege of riding with the former Chef d’equipe of the United States Equestrian Team, George H. Morris, this past week. The Weeden's have been fortunate enough to have Morris teach some of their students during the WEF circuit. Benjamin rode a new horse she is leasing for the Equitation division named No Excuses. She placed in the top ribbons in the Equitation classes this week amongst some of the top riders in the country. Benjamin attends Lake Forest Academy and works with a tutoring service while on the road. “I do all the work that my classmates are doing and take the same tests and quizzes but just at my kitchen table with a tutor instead of in the classroom! It actually is very easy to manage, surprisingly. I have never had an issue with being behind in school or anything like that,” explained Benjamin. Benjamin and Brookwood Farm will remain in Wellington for a few more weeks to finish the series. Caroline Weeden aboard Piper Benjamin's Topsider at The Chicago Hunter Derby. Brookwood Farm also hosts the Chicago Hunter Derby for Chicago Equestrians for a Cause, helping to raise funds for local charities. The event is one of the best events of its kind in the country and last year raised over $150,000 for its charities. This year the event will take place on September 6th and 7th. For more information on the event please visit www.chicagohunterderby.com. For more information on Brookwood Farm, please visit their Facebook page atwww.facebook.com/pages/Brookwood-Farm.